BTSxJimmyKimmel trended worldwide for several hours following the fancam leak. Before their eagerly anticipated appearance at the American Music Awards 2017, the boys of BTS dropped by Jimmy Kimmel Live! to film their outdoor mini-concert which was attended by some of their most loyal fans. Lucky for die-hard ARMYs (BTS fans) who weren't able to witness the live performances of their idols, they won't have to wait two more agonizing weeks to see what the boys have in store for them. Some BTS fans shared what went down during their mini-concert which featured performances of "Mic Drop", "Blood Sweet & Tears", and "Fire" to name a few. Following the fancam leak, BTSxJimmyKimmel trended worldwide for several hours. 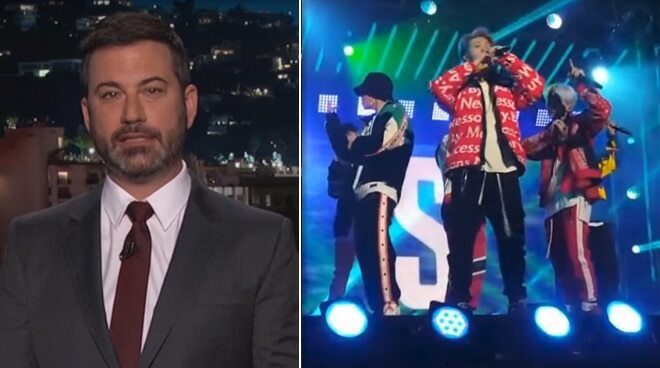 Meanwhile, Jimmy Kimmel and his team decided to introduce the moms of BTS superfans to the boys themselves to let them know why their children were willing enough to camp out for days outside the Hollywood Masonic Temple just to see their K-Pop heroes. BTS is set to perform at the American Music Awards on Monday, November 20 while their mini-concert on Jimmy Kimmel Live! airs on November 29.